The long-standing partnership between Nike and Apple has been beneficial for both companies, and Nike's chief executive hinted on Friday that additional projects were in the works even as Apple encroaches on Nike's territory. 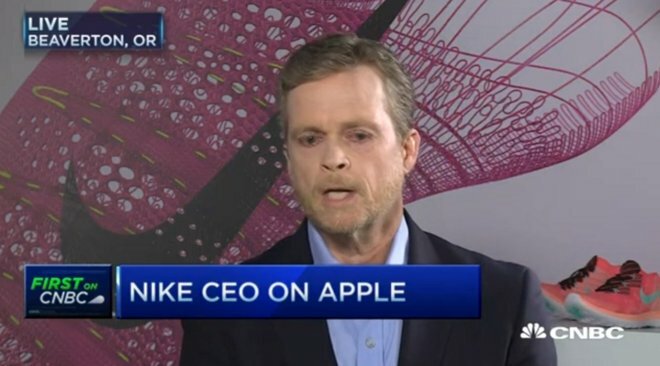 "We're excited about the potential that the Apple-Nike relationship has," Nike CEO and President Mark Parker told CNBC. Parker touted the Nike+ Running app that works with the Apple Watch, calling it a "great experience." Nike continues to develop new fitness apps and extend its current offerings to take advantage of wearable devices, despite shuttering its own wearable division. More than 60 million people use Nike's fitness apps, Parker said, though that number likely also includes Android users. Wearables are "a really important part of our future, and really central to our brand," Parker added. Apple's relationship with Nike dates back to at least 2006, when the two companies collaborated on Nike+iPod, one of the first popular connected fitness trackers. Apple chief Tim Cook sits on Nike's board of directors. The Apple Watch and its associated Activity app represent a somewhat competitive step toward Nike from Apple, as it could remove the incentive for some users to jump onto the Nike+ platform. Despite that shift, Parker says that consumers can expect "more from Apple and Nike, two great brands, lots of potential and opportunity, and that continues."